Tater tot casserole is such an easy simple dinner! Totally kid friendly and very filling, you cannot go wrong with combining a few simple ingredients and putting this one in your rotation. Tater tot casserole (often spelled Tator tot) is a well loved family friendly meal that can easily be altered into a new recipe for many different experiences. While this recipe is a chicken and cheese version, you can also make a taco tater tot casserole with hamburger meat and taco seasonings or form this into a breakfast casserole for a deluxe breakfast of kings! This recipe is super simple that you should have no problem making for dinner tonight. As with all recipes, the timing will depend on your own oven, so while its listed as 30 minutes of baking time, start checking around the 25 minute mark to be safe. In a large bowl, whisk together sour cream, cream of chicken soup and dry ranch mix until well blended. 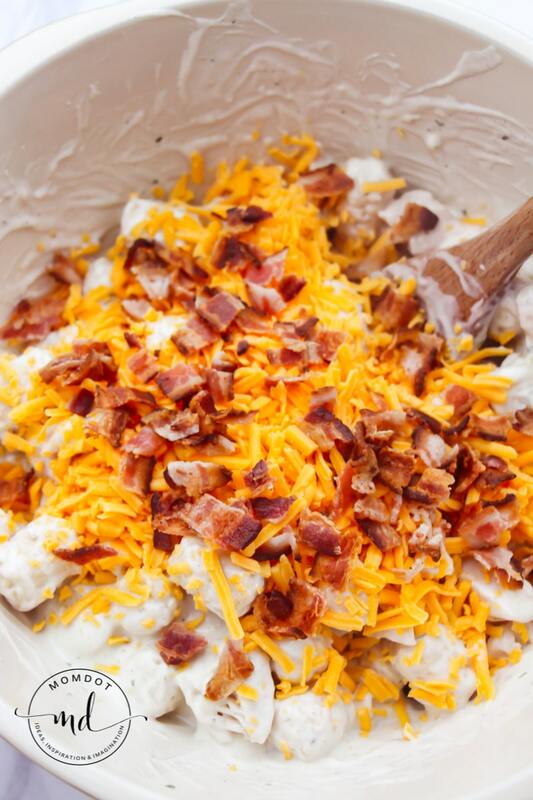 Add in chicken, bacon and cheese, stir well and then add frozen tater tots. Make sure your soup mixture and cheese is well blended throughout the frozen potatoes. Pour your casserole into a 9″x12″ oven safe casserole dish. Bake for 30 minutes, until bubbly and if you like, slightly crisp on the top layer. Tips: Personally I love “extra” so adding more cheese to this recipe is a choice you and your family can make! Plus, feeling guilty about the carbs? I mean I never do, but add some baked asparagus to please the mom inside you. Feel free to add more 5 minutes prior to the recipe being done for the ultimate cheesy tater tot recipe. 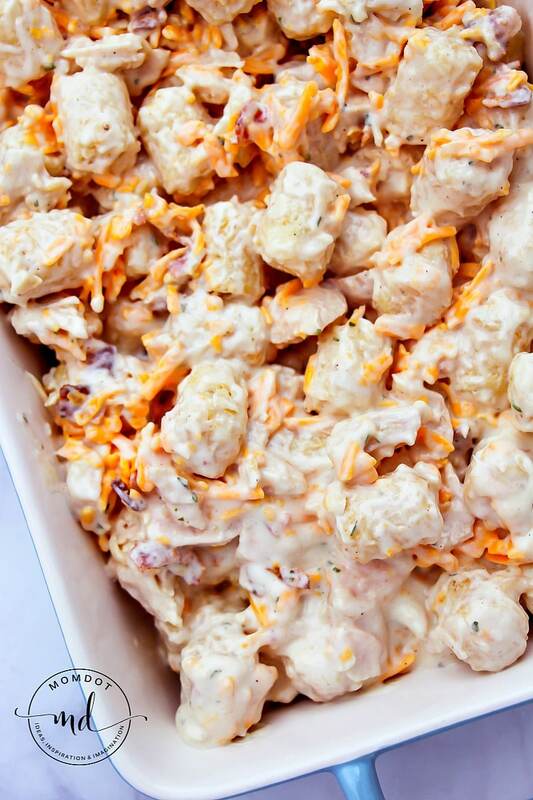 Tater tot casserole is such an easy simple dinner! Totally kid friendly and very filling, you cannot go wrong with combining chicken, cheese and bacon and putting this one in your rotation. Add in chicken, bacon and cheese, stir well then add frozen tater tots. Pour into a 9"x12" casserole dish.